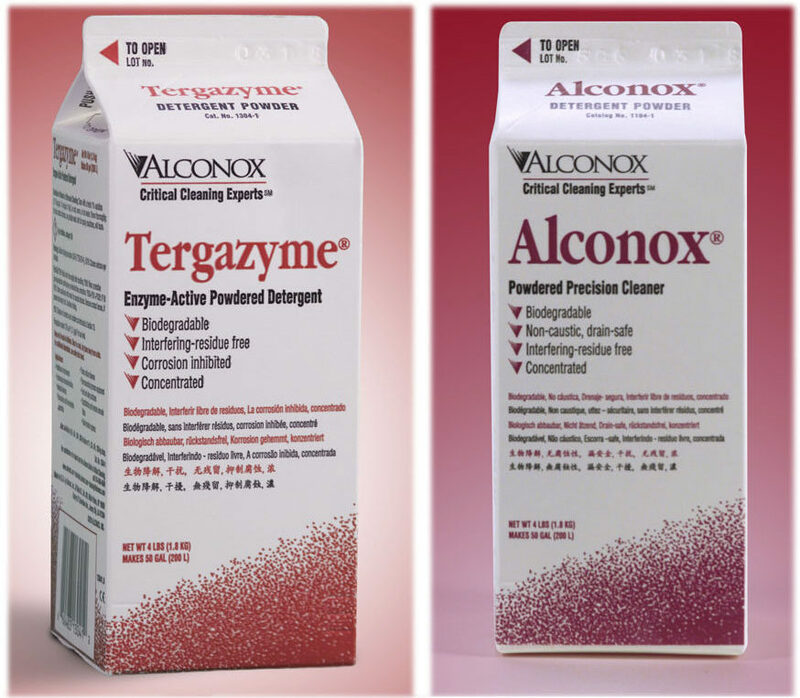 Q: What is the difference between Tergazyme and Alconox? Is one better? Is one more mild? 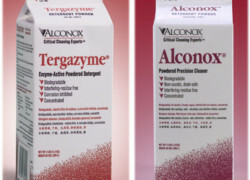 A: There are several similarities and key differences between Tergazyme® Enzyme-Active Powdered Detergent and Alconox® Powdered Precision Cleaner. Both detergents are powerful emulsifiers and excellent detergents for the removal of organic and oily residues. Both detergents are well suited for use in ultrasonic baths, or other forms of manual cleaning including scrubbing and soaking. They are both mild alkaline cleaners (pH 9.5) in a powdered detergent format. Tergazyme and Alconox detergents have a shelf life of the undiluted powder of 2 years. The detergents are free-rinsing, interfering residue-free and biodegradable, with no added dyes, fragrances, brighteners or softeners. Tergazyme detergent does have the added benefit of proteolytic enzymes which greatly assist in the removal of bioresidues and fluids including blood, tissue and other proteinaceous contaminants. Due to the presence of these enzymes, unlike Alconox detergent, the Tergazyme wash solution should be kept below 130F/55C to avoid enzyme degradation. (Alconox detergent solutions can and have been used up to boiling temperatures.) Additionally, Tergazyme solutions should be used within 8 hours to avoid autocatalysis, as after all, the enzymes are made of proteins. This also explains why Tergazyme has such a high effective shelf life compared to liquid enzymatic detergents. While both would do a great job in applications including cleaning of medical devices, and other parts exposed to biologic residue, Tergazyme gives an extra edge. This includes tattoo and healthcare applications where parts are to be cleaned and disinfected between uses. We’d love to discuss how Tergazyme detergent may be of use in your particular application.